Soup season is coming! I love soup. This one is almost a stew, but not quite. I used "beef" in the title but almost any ground meat will do. This batch was made with deer meat. I prefer to use a leaner ground meat so there's little fat to drain off. Ingredients are approximate. Brown meat in a large pot. Drain off excess fat if needed. Add onions and tomatoes and cook, stirring occasionally until onions are tender. (If meat is very lean you may need a little olive oil). Add tomato juice, water, and herbs. Bring to a simmering boil. 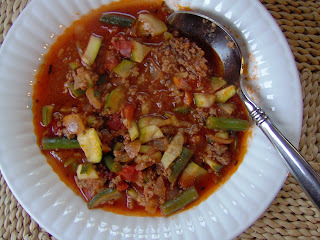 Add the other vegetables and simmer to desired tenderness. Season with salt to taste. Serves 6. This post is linked to Fightback Friday. Carol Kicinski of Simply Gluten-Free has a flourless pancake recipe using ricotta cheese called "Gluten Free Ricotta Lemon Pancakes". Ricotta cheese is not legal on the SCD, so I substituted with dry curd cottage cheese, also called farmers cheese. They were very good. They reminded me of french toast without the toast. Thanks Carol! 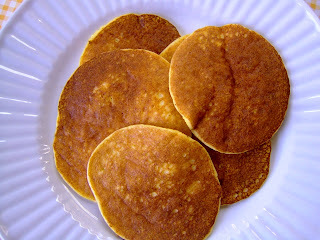 Here is a link for pancake syrups. I also have a recipe for Raspberry Syrup. 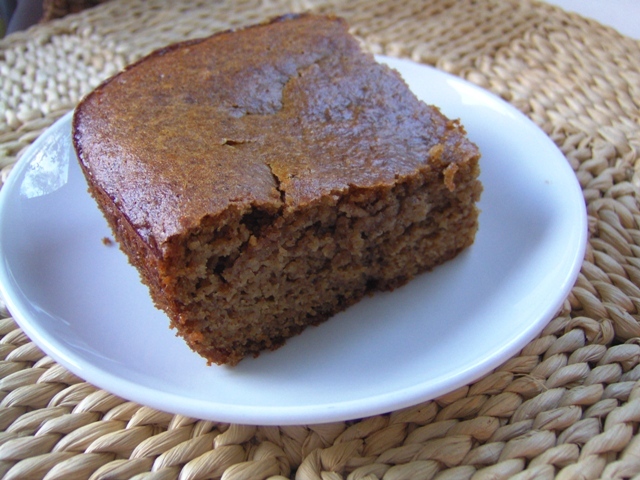 I had some butternut squash leftover and was in the mood for a nice moist snack cake. I adapted this from Almond Butter Pumpkin Brownies at This Primal Life. I added and extra egg and some spices and voila, a nice little cake. I've made her pumpkin brownie recipe before as well and it was delicious. Preheat oven to 350 degrees. Grease and 8" x 8" cake pan. In a large mixing bowl, mix almond butter until smooth. Blend in other ingredients one at a time. Pour into pan and bake for 30 to 40 minutes, until cake tests done with a toothpick. This post is linked to Pennywise Platter Thursdays and Allergy Friendly Lunchbox Love, Fightback Friday, and Sugar Free Sunday. Autism, Carbs and Dysbiosis... Is Science Catching Up? I must apologize. It's been a month with no recipe postings, and I'm still empty handed. I have several things I have been working on but they are just not there yet. However, I do have something very fascinating to post about. I like to follow Dr Paul Whiteley's blog, Questioning Answers. He is an autism researcher from the UK and posts frequently about diet and gi issues in autistics. Since Gordon is a gi ASD kid I like to keep up with the latest research. This weekend he posted on something huge in this area. It is a study by some top researchers in this field and it is finding the genes to metabolize carbs in some gi autistics are not working. They are also finding the wrong bacteria. They are speculating that these unused carbs are feeding this wrong bacteria. The article is very sciencey, a bit hard to follow, but you can still get the gist. It is titled "Impaired Carbohydrate Digestion and Transport and Mucosal Dysbiosis in the Intestines of Children with Autism and Gastrointestinal Disturbances". Link HERE. Dr. Whiteley gives his easier to understand take on it here and here. The bottom line of the study is "These results indicate a relationship between human intestinal gene expression and bacterial community structure and may provide insights into the pathophysiology of gastrointestinal disturbances in children with autism." 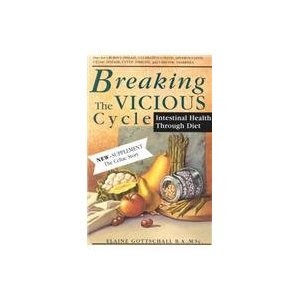 For anyone who has read Elaine Gottschall's "Breaking the Vicious Cycle" the article will be deja vu, just harder to read. What amazes me is that Dr. Sydney Haas was onto this over 80 years ago. In his book Management of Celiac Disease, in 1951, he speculates that Celiac Disease is caused by a bacterial source that eats certain carbohydrates, remove those types of carbohydrates and you starve out the bacteria. This work was before the discovery of gluten and the current biopsy used to diagnose Celiac Disease. So it is really hard to know how many people back then were true Celiac's and who may have had Crohn's and other bowel issues. (Although it would be interesting to see a modern study on the SCD and Celiac's). What's more, Dr. Haas seems to discuss autistic behavior in this book. He isn't the only one to notice this odd behavior in gi patients either. He cites several other doctors who comment on it as well. "Czerny and Keller (1923-1928) were struck by the lack of attention to the psychological aspect of celiac disease on the part of many authors". Elaine puts excerpts from the book here. I almost forgot to mention. Dr. Timothy Buie is one of the authors of this study. He is known for heading up the 2010 study in American Academy of Pediatrics "Evaluation, Diagnosis, and Treatment of Gastrointestinal Disorders in Individuals With ASDs: A Consensus Report". He also has an interesting interview with the Autism Advocate called "Gastrointestinal Illness in Autism" . You can view a very interesting speech he gave at the Maine CDC Here. It will be interesting to see how the media portrays the study, if they pick up on it at all. OK, not food related, but very cute. This is a song from The Miracle Project, a group that works with special needs kids. This is a duet with Jack Black and a boy named Wyatt Isaacs, who has autism. I enjoyed it because I have had to cut so many tags out of my child's clothing. He's also quite fearless, except for fear of loud flushing public toilets.